President Connie Ledoux Book (first row on the left) with Elon’s 2018 Top 10 Under 10 Alumni Award recipients. Elon graduates are committed to global citizenship, service, and creative problem solving and they fill desperate needs in the world as entrepreneurs, doctors, government officials, teachers, writers, researchers, journalists, and business leaders in communities around the world. 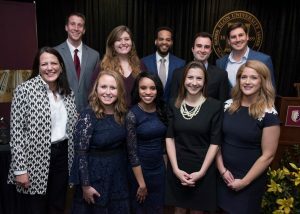 Top 10 Under 10 – presented each spring to honor outstanding alumni of the past 10 years who have achieved major professional success, acted as difference makers in their local communities, and served Elon as partners, advocates and investors. The Elon Black Alumni Network (EBAN) Awards – presented annually during Homecoming weekend as part of the EBAN Alumni Awards Ceremony. The LGBTQIA Alumni Network Awards – presented annually during Homecoming weekend as part of the LGBTQIA Community Enrichment Awards brunch.